Stocks in China declined Monday as investors returned from a weeklong break for Lunar New Year, the country's biggest holiday. 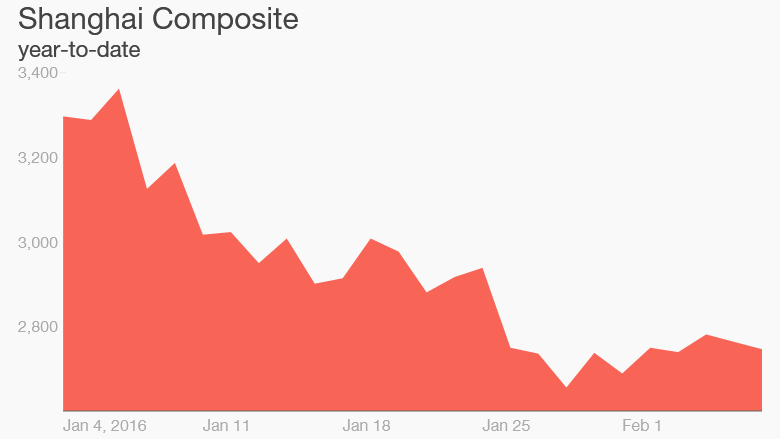 The benchmark Shanghai Composite fell nearly 3% when the market opened, but later recovered to close down 0.6%. The loss follows last week's dismal trading in Asia during which Japan's Nikkei plunged more than 11%. Hong Kong's Hang Seng Index lost 5% over the last two days of the week after being closed for the previous three for the holiday. More broadly, an index for global stocks sank into a bear market last week. Further weighing on investors Monday were gloomy trade figures out of China that "point to a shaky start to the year," wrote Capital Economics. Export growth slowed more than expected, contracting 6.6% in January in yuan terms, compared to the same period last year. That's significantly worse than the slight expansion of 2.3% in December. Imports were also disappointing, shrinking 14.4% in January, versus 4% the prior month. Shanghai stocks have now tanked a whopping 23% so far this year. For China, the beginning of the calendar year is notoriously volatile as the country largely grinds to a halt for the Lunar New Year holiday. Factories and businesses shut down as workers return home to celebrate with family. That means a raft of economic data for the first two months of the year -- from manufacturing activity to trade figures -- are subject to seasonal variations. A clearer picture of overall economic health often doesn't start to emerge until at least March. Still, China is now posting its slowest annual growth in 25 years, raising questions about how quickly the country's once red-hot economic engine is cooling off. Chinese stocks posted a meteoric rise last year, before a spectacular summer crash gave investors whiplash. Volatility has flared again at the start of this year. Declines in the value of the yuan, along with investors pulling hundreds of billions of dollars out of China, have deepened concerns.